The days following the first conference of Research Software Engineers (RSEs) saw the launch of a German RSE chapter de-RSE. It was formed by RSEs working inside and outside Germany, and it will further the shared objectives of RSEs and become the collective mouthpiece for RSEs within the German science. All of the authors were exposed to the day-to-day problems caused by using software in science, and this meant that many of us were following the Software Sustainability Institute, and a few other activities around the globe. The lucky ones among us were even able to participate in events over the last few years to see how to improve our situation. 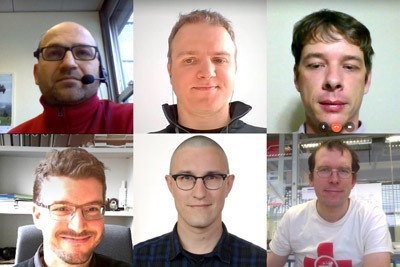 Over the last few years a critical mass of motivated Research Software Engineers (RSEs) formed at various locations across Europe, North America and a few other countries. Then in September 2016, the world's first conference for RSEs took place in Manchester. It was the right time for this event. Bringing together RSEs lead to discussions about how to transfer the UKRSE spirit to other countries. How could other national science systems benefit from the professionalisation of software engineering in sciences? How can the people behind research software receive the the acknowledgement and resources they deserve? Our contribution is mainly, but not only, in the area of scientific software development. We want to prepare science for the ever-increasing influence of new technologies and new IT concepts, help the community cope with the challenges posed by the increasing digitalisation of research, and help to exploit the resulting opportunities. We believe that the de-RSE can promote the sustainability and falsifiability of scientific software development as part of research processes, persuade more researchers to view software as a foundation of publications and research data, and promote scientific software as a key building block in Open Science. We want to establish research software engineering as an essential core competence, especially among young scientists who will become the next generation of researchers. We can do this by supporting the professionalisation of software development in research through training and the application of minimal best practices. We want to improve job advertisements and searches by promoting a generic term for software development in academia. Ultimately, we want to integrate research software engineering into higher-level activities, e.g. in the context of e-Science and e-Infrastructures. And last but not least, we want to give RSEs a voice and represent their interests within the German science landscape. To achieve our objectives, we are already have a number of plans, some of which are underway. We will provide a forum for the exchange of computer scientists, software developers, RSEs and scientists developing in and for research, implement Software Carpentry (SWC) workshops or workshops that follow the SWC concept, establish a Fellowship Program in which ambassadors represent and realise the aims of the German RSE community locally, regionally, nationally and internationally. We're going to organise an annual research software conference, covering software engineering and not only for RSEs, help to establish RSE teams in research institutes, universities and other scientific institutions and organisations, and establish a national centre for research software, covering the German research landscape and embedded in the e-Science and e-Infrastructure movement. The German RSE community will bring together researchers, scientists and other software developers working in Germany and help uncover and address issues related to the use of software in research. A mailing-list, slack channel, and GitHub organisation have been set-up to help the community communicate. In January the first de-RSE Community Call took place together with the Open Science Call of a Working Group of the German Open Knowledge chapter. Successive de-RSE Community Calls will take place on the first Thursday of a month at 2pm. Anyone is invited to join! Get in touch with like-minded peers, reach out, and contribute with your own topics, ideas, and activities. Information on how to join can be found on our website.